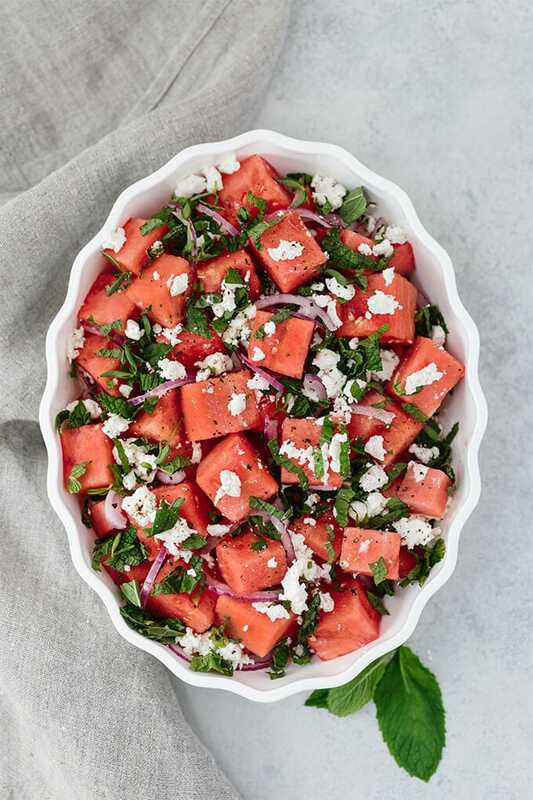 Watermelon Feta Mint Salad with red onion is a super refreshing summertime recipe. 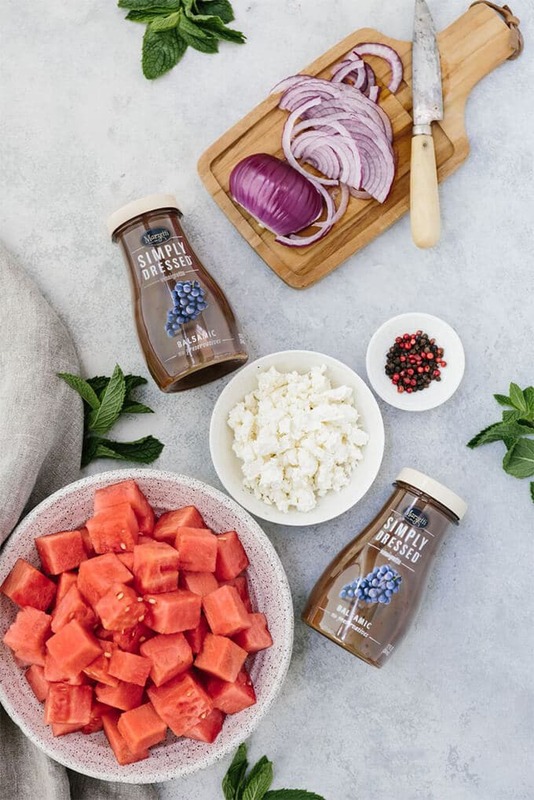 The simple balsamic dressing in this unexpected combination of flavors takes the salad to the next level. Perfect for BBQs and outdoor meals, too! This post is sponsored by What’s For Dinner? All opinions are 100% mine. There are several reasons why summer is my favorite season, but I think summer food is on top of the list. Among all fresh veggies and fruit, watermelon has the most important role in our home. 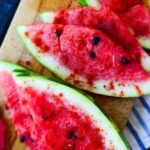 I remember I would almost live on chilled watermelon alone during summer months as a child. Mom wouldn’t even bother peeling or chopping it, she would just give me a big slice and I would gobble it up, leaving its rind for sure. I knew it wasn’t the cleanest way to eat watermelon, but I found it more fun when the watermelon juice ran down my elbows. I think my current love of watermelon feta salad goes back to those years. I can’t think of a better dish when I have no time to prepare lunch or dinner. Sweet, savory, refreshing and creamy flavors are all in one dish. Believe it or not, we happily enjoy this amazing salad even at breakfast. It is a staple in our home during the summer season. So I was really excited when the website What’s For Dinner? 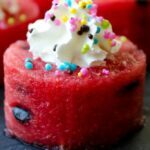 reached out to me and asked me to try a Watermelon Feta Mint Salad recipe with their own twist. I accepted it without a doubt. It’s a new website aiming to provide recipes when you don’t know what to make. Also, they offer a new twist on the everyday meal. I’m sure it will become one of my favorite websites especially when I feel stuck and can’t decide what to make for dinner. I didn’t tell anyone that I used a new watermelon salad recipe when I served it as a side dish at dinner the other day. 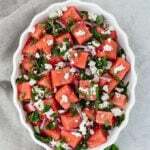 As suggested in their recipe, I combined watermelon with feta, fresh mint, red onion and Marizetti Simply Dressed(R) Balsamic salad dressing. 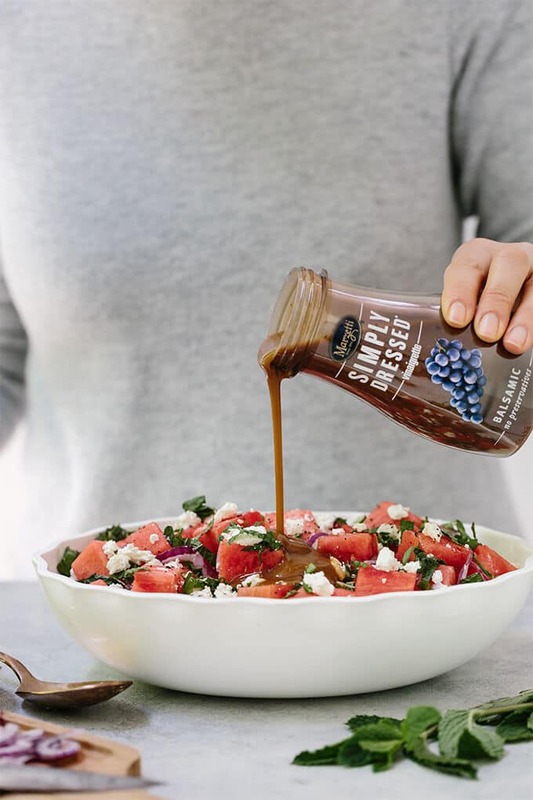 My husband was amazed by the balsamic dressing effect (the question of what dressing to serve with watermelon salad is solved!) and the crunchy red onion addition. He says our classic watermelon feta salad reaches perfection with this twist. Sweet watermelon, salty feta, refreshing mint, tangy balsamic, crunchy and bittersweet onion make the most unexpected, yet super tasty combination of flavors. Oh I almost forgot to mention the black pepper. Don’t ever think of leaving it out because it complements all the flavors in the salad. 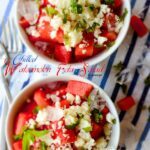 Besides, it gives a subtle spicy touch that results in the best Watermelon Feta Mint Salad you will ever have. 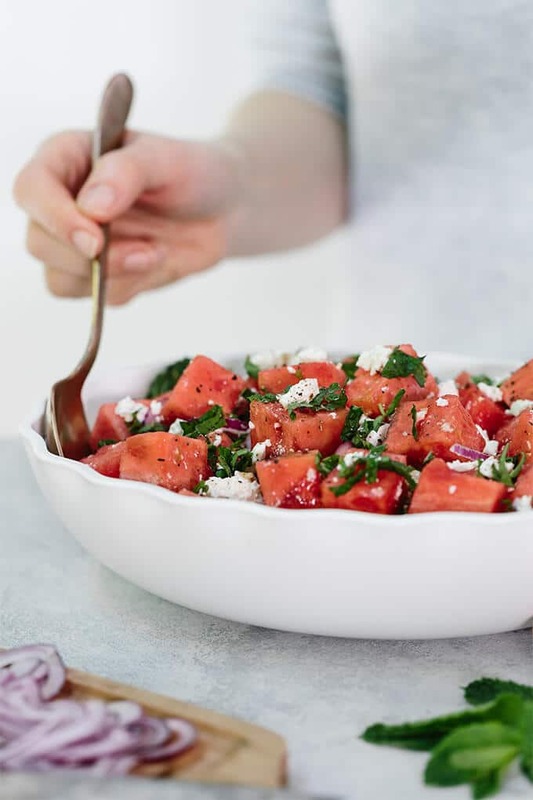 If you are one of those rare people who have never tried watermelon feta salad, the first thing you should know is to buy a good watermelon. If you know almost nothing about the fruit, the best method is to taste it before you buy. You need to go to the local farmer’s market to have this chance. Also, farmers are willing to help you pick a ripe watermelon. If you don’t have this option, you need to take over the job. To understand whether a watermelon is ripe enough, go for the classic method that farmers always apply. Tap it and try to understand the sound. It is ripe if the sound is deep and almost echoes. Avoid the watermelons that sound dull. Try to pick the heavy ones for their size. Big and lighter watermelons are not ripe or sweet enough. It’s better to crumble the feta over the top of the salad. If you toss it with the other ingredients in the bowl, it gets too crumbly. I recommend that you chill the watermelon beforehand. The salad tastes even more refreshing this way. 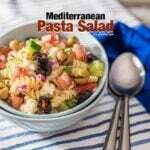 There is no salt in this salad recipe as the feta has already a salty flavor. Please visit What’s For Dinner? to see the full recipe. 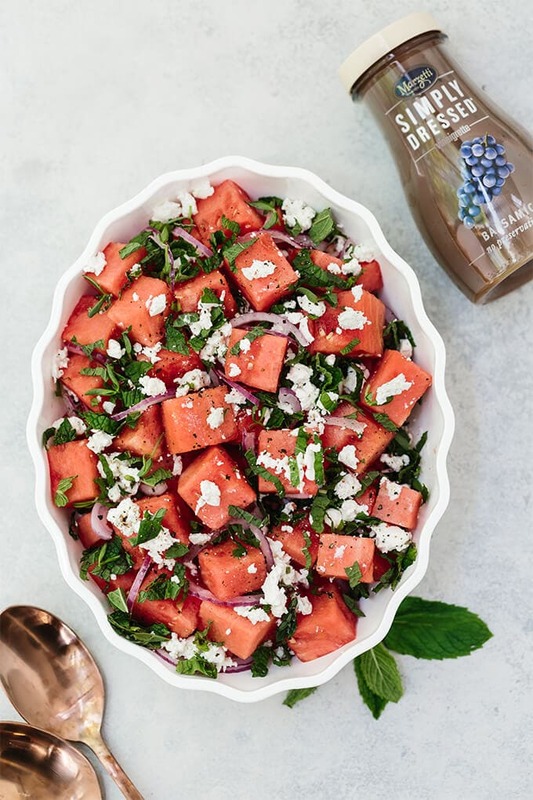 A refreshing watermelon salad with a super tasty balsamic dressing. Hi Adina, watermelon has always something to do with our childhood, doesn’t it? I sometimes prefer buying already cut ones especially when the vendor doesn’t seem friendly or reliable or when watermelons are too big for us to finish in a few days.Thank you for sharing your memories with us. Cheers!